We wore them on a 4-mile hike and were amazed. When the time is right, I love to pick up staples that I always forget I need: no-show socks, for example. 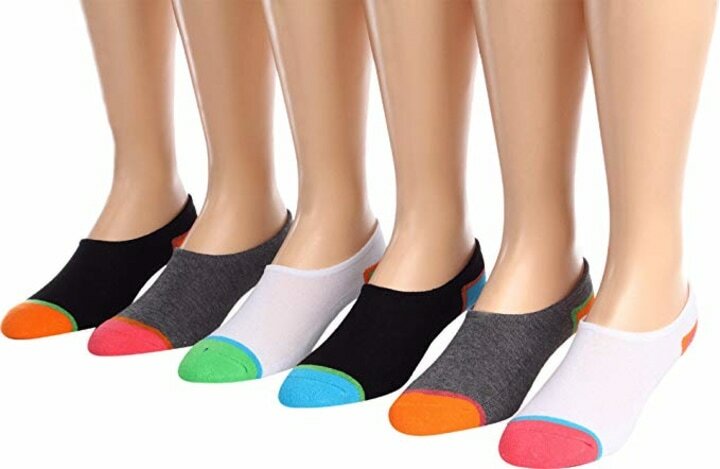 Finding a pair of low-cut socks that don't slip down into your shoes is nearly impossible, so when I got the chance to try a pair, I jumped at it. Also available at Zappos and Kohl's. The package says the socks are “made for Chucks.” But, would they work with any sneakers? I found out. I took them on a trip to central Oregon, wearing them on 10-mile bike rides, long walks in 90-degree weather, and a steep, 4-mile waterfall hike. I kept waiting for the socks to slouch down to the bottom of my shoes during the long hikes and bike rides, but it never happened — the ribbed cuff magically stayed in place just below my ankles. Some low-cut socks can run small and pinch your toes ... but not these. They're nice and long. They feel supportive under the arch of my foot, thanks to the padded (but not overly cushy) sole. They were also breathable — at the end of a hike on a hot day, my feet felt cool and blister-free. Even though the packaging says "made for Chucks," don't feel limited to wearing them with Converse: I used them in a variety of athletic shoes, with all positive results. Plus, they come in cute colors — a bright multi-pack, white, black or stripes. Some reviewers found the socks ran too large, but after a couple of washes, I found they fit just right (I wear an 8.5-size shoe). Yes. It's all about that unicorn combination of no-slip and no-show. Or as one reviewer put it: "These are amazing! Just the right amount of cushion, and the sock is only noticeable when you're looking for it." Bingo.